Flowers, A.R. De Mojo Blues: De Quest of HighJohn de Conqueror. New York, NY: Ballantine Books, 1985. Three bloods, black soldiers, return from the Vietnam War and adjust to life without the Army. Tucept Highjohn, back in Memphis, finds a secluded house on stilts in the woods where he studies the hoodoo path. He first heard the call in the jungles of Vietnam where Jethro, a brother who always watched his back, gave Tucept a set of mystical bones on the night before he walked into an ambush and died in a golden bamboo garden. 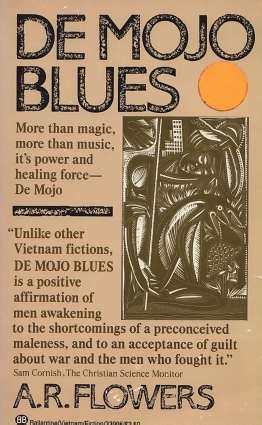 Back home, Tucept apprentices himself to Spijoko, a Beale Street Blues oldman, a hoodoo man, who helps him become Highjohn De Conquerer, a Shaman of the Tribe, a Stormbringer, a Mythmaker, and a Healer. In this remarkable first novel, told in a multitude of voices, Tucept claims his own soul, then uses the power that grants him to pour healing mojo on the souls of the needy. Haskins, Jim. "In Short: DeMojo Blues: De Quest of HighJohn de Conqueror." New York Times, January 19, 1986. P. BR20.